The Fennec Fox with its scientific name Vulpes zerda lives in the Sahara Desert of North Africa. Its most distinguished feature is its large ears, and it is the smallest species of canid in the world. To enable it to stay in the desert, its coat, ears and kidney functions are adapted to high-temperature, low-water and the desert environment. The large ears are sensitive, and are able to detect sounds from prey even if preys moved underground. This cute-looking fox is a carnivorous mammal with a life-span of 10 years living in the wild. Its predators include African varieties of the eagle owl and caracal. Other predators include jackals, the saluki and striped hyenas. A saluki is a greyhound-like domestic dog in Africa. But Fennec lovers may rest assure that the flurry creature is difficult to capture. 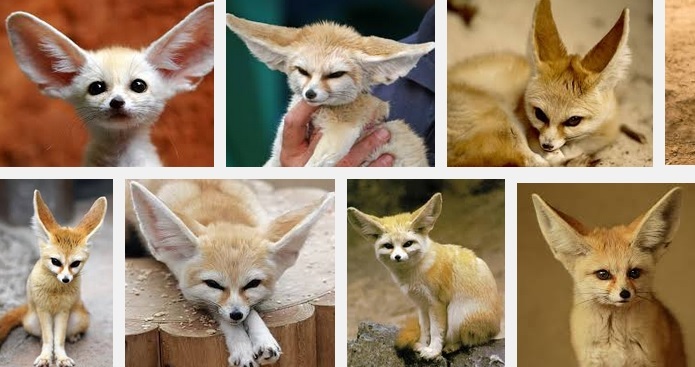 The Fennec family lives quite like other Sahara Desert inhabitants. They dig out dens in sand for protection, and may dig areas as large as 1300 square feet. They also live closely with their other families, with dens connected to each other underground. Also, the dens are often sheltered by plants with sand dunes, which is an ideal habitat for this small animal. At this moment, this species of fox is not in any danger of extinction. However, the lovely Fennec fur is a prized possession of the indigenous peoples of North Africa. In some other places, it is considered an exotic pet. However, it is under the “Least Concern” list on the International Union for the Conservation of Natural and Natural Resources (IUCN) Red List. However, the trade of Fennec’s fur still needs to be controlled to avoid any possible threats. While its fur may be attractive, their meat is not eaten by humans because it was said to be foul smelling. Fennecs are small, weighing an average of 1.2kg. It can grow up to 40 cm long and 20 cm tall, with a black-tip tail. The large ears can grow up to 15cm long. The Fennec fur is a cream color, helping to deflect heat during the day, and the fluffy texture keeps the Fennec warm at night. The large ears too, play an important role to dissipate heat from the Fennec, and it has many blood vessels close to the skin. At the same time, the Fennec’s thick fur protects the sole of its feet from the hot desert sand. Natural Habitat & Protecting Itself The little cute animal is a desert animal, staying in the desert areas from the western area of Saharan Africa to the north of Saudi Arabia, Jordan and Southern Israel. They are small and light, and they are also equipped with large ears. The foxes have light brownish fur, matching the golden sand color of the desert.. These little foxes also has little teeth. They do not need large teeth, since they do not eat large foods. They like to eat plants, insects, eggs, small reptiles and rodents. They are also not afraid of dehydration, because their little bodies have already adapted to the lifestyle. They also have kidneys that are already adapted to the dry conditions of the desert, and will not easily let them lose water through urine and feces. Their large ears are able to dissipate heat easily, and their thick furs will also protect them against the heat or losing water too easily. The little fox is also nocturnal by nature, as they stay inside their underground homes during the day. This is the first kungfu that the little Fennec has. These foxes have the speed of a magician. When it meets with predators, the first thing it can do is to jump and dive and dig into the loose sands and make ways to escape from the predator. Have you ever heard the wailing of these foxes before? Well, if you plan on keeping your exotic pet fox together with a cat or a dog, you will find that they might regularly surrender to your Fennec in fights or arguments, just because they are afraid of its purr-like sound that might sound like a nag. It will even make your most persistent cat surrender! While these foxes are not a kungfu fighters, it will still be able to protect itself, whether in the wild or domesticated. You need not worry about it, just enjoy the cute looks while it stays with you for the next decade. Just be sure that you remember to keep the exotic pet leashed when you’re outdoors with it so that it does not use its skills to run away from you. Household Pets: Exotic Fennecs are currently bred as house pets, usually taken from their mothers while still young to ensure that they are tamer and more easily adaptable as a pet. This little mammal is the only species of fox, besides the domesticated silver fox, which can be kept as a pet at home. Before owning these exotic foxes as a household pets, you may wish to check with your local animal control authorities to see whether there is any legislation prohibiting domestication of the little flurry animal. You may also need to check for vaccinations, as some local authorities may require the administration of vaccinations on the Fox before you can bring it home. Some authorities may also require an exotic pet permit. When you take care of these species, you may also wish to know whether your local veterinarian will be able to treat them. Most will care for these foxes just like a dog or a cat, but some vets might refuse to treat them, or charge premium fees as they may consider the mammal as a wild animal. Anyone who wish to keep a supposedly “wild” animal should be prepared for some hyperactive, wild personalities. This applies to these foxes as well, as the cute little creature is very quick and is capable of digging underground up to 20 feet in a day! Being nocturnal will also mean that the little rascal may disturb your sleep, and keep you awake throughout the night. Little fox may also hoard foods all around the house. Its natural instincts may bring it to dig your new sofa cushions with the hope of creating a den or nest. You may also want to keep the this Fox locked up, because it is one of the most notorious escape artist! Otherwise, you may find it leaping from shelf to shelf, cabinet to cabinet and run around jumping from one table to another. Common Living Habits If you are not yet an owner, you may wish to know what are its habits so that you may know what to expect of these exotic pets and have some preparations. You may wish to know that your little fox is nocturnal by nature. It will sleep during the day and wake up near evening and stay wide awake during the night. You will give up trying to get it to sleep during the night, you just need to realize that these foxes are very energetic, so you need to be used to it. You may not need to entertain it, though. However, there are reports of these foxes eventually readjusting its time zone to suit its owner’s timing. If you would like to retrain your pet to follow your time zone, you may wish to engage in some physical activities with the energetic creature. That is, provided that you do have that time. You may wish to keep it leashed, and bring it for some runs, but it runs very fast. You may want to let it play catch, but do keep that activity indoors. Fennecs are naughty animals that will want to eat anything it finds. In the wild, the little creature will dig and scratch into the sand during the night (remember they are nocturnal? ), and when they have become pets, they will still carry forward this same behavior into their new homes. Digging is a very normal habit, and eating wildly is another. It likes berries, insects, vegetable and all kinds of things. You may wish to keep some of these foods in handy besides some high range canine food. Not the type that you will like to hear, though. The yelping of these foxes is not the most melodious, and it is a combination of barks, soft purrs, squeaks, and even warning calls. You might not be used to it, but it cannot be helped because you are keeping this exotic animal at home as your pet. Exotic pet owners do have a lot of surprises and different types of expectations. You must count on these little critters making noise too! Why does the fennec like to dig? Habit. In the natural settings, the fennec fox digs its own home, burrowing deep into the sand underground. It can be almost four feet deep, and the tunnels can be more than thirty feet long. They choose their natural habitat in at the base of dunes or low hills with moisture, and this helps to keep their homes cool. This helps to ensure that the fennec will be able to stay cool in the desert lands. This is one of the ways that the little creature avoids losing water in the hot desert lands. These are just the basic habits that you must know about these animals. Just be prepared for it. Good luck! Controversial Facts Debunked When you dig information about the tjhese foxes from the Internet, many people will claim to be experts and there will be many conflicting and controversial facts about the little fox. It can probably be attributed to the fact that very little research has been done about this little fox, yet recent years have seen the growth of interest in these exotic foxes. Some say that the little fox is from the fox family, while others say that it is from the dog family. So, which family does it come from? Some sites mentioned that the Fennec is the smallest of the canid species, which includes BOTH dogs and foxes! It may be a little bit confusing for those of us who are not studying much about animals, learning about dogs and foxes can be challenging. Scientists will explain to us about the comparisons of chromosomes and would also encompass wolves in the same family of Canidae. In some records, foxes are more like the ancestors of the canid species. Meanwhile, some people explains that the fox family sits between dogs and cats, which makes us ever more confused. Some classify the Fennec as a carnivore, while others will say that they are omnivores. They are more omnivore than just carnivore, because it eats berries, fruits and desert plants too. There is very limited water source in the desert, and the Fennec rely its water source from fruits, berries and plants. Yet again, this agile nocturnal creature is not going to be an eager vegetarian, because it also eats insects, small rodents, snails, lizards, birds, eggs and other small animals. Some sites will actually recommend giving dog food to these foxes, since it is the same family as dogs. However, it can actually also go to the extreme of introducing worms into their diet, and very often pet owners might ignore the fact that Fennecs are omnivores and need their veggies too. Fruits are a good option, but they are definitely not a cat even though it might eat that mouse sniffing for cheese at your home. Can it be domesticated? Some states and countries list the Fennec Fox as a wild animal, while others will allow them as a pet. While Fennec Foxes become a pet more and more each day, some maintains that it is still a wild animal and say that they cannot be domesticated. By definition, domestication means the adaptation to home life. Some actually defines it as tame or naturalized. Meanwhile, Princeton links domestication to the adaptation to intimate association with human beings. So, can these foxes be domesticated by these definitions? Fennec owners may experience some mischievous behaviors from the cute fox with extra large ears. These little guys may find opportunities to jump from one cabinet to another, and will sometimes be scratching the floors with the hope of digging them just like what they would be doing in the desert land. However, if we define that these foxes are not domesticated by these actions, cats are not domesticated pets too, given that they still scratch our favorite sofas and curtains, and pounce from one surface to another. The Fennec can be trained to live with humans, and some may also train the them for litter, even though it can be difficult. Owners have made significant progress with their pets, saying that the foxes can be taught to respond to owners, coming when called and trained to poop in their litter box. Training them is somewhat similar to dog training, and some owners even play catch with their foxes to burn some of those excess energy that it has so that it does not run around pestering other home pets to play with it. In fact,they can also be taken for walks provided that owners leash them. Unleashing is a bad idea, because the Fennec is an opportunistic escape artist. It runs very fast too, and once it scampers off, chances of recapturing it is very slim. While the Fennec may not suffer from body odour, but the indigenous people reported that they will not eat the meat of these animals because it has a bad smell. However, some web posters did complain that the meat smells awful, with smell that can be detected from about 5 cages away! (one web poster posted this comment for a pair seen in a zoo. Maybe they do not smell that bad after all. They are omnivores, which means that it is open to the options of eating fruits and vegetables. This probably helps reduce its odor, and they love grapes.